Daily Harvest: Daily Harvest made it into my list of favorite things two months in a row! That rarely happens, but the honor is well-deserved. For those of you that follow me on Instagram, you probably know that for most of this month I have been following a pretty intense gut protocol to rid my body of harmful bacteria and parasites. (More on that below). I am just about done with my second week of the protocol and have been feeling a lot better, but the first week and a half was pretty intense. My stomach never quite felt normal and I wasn’t all that hungry or motivated enough to make food. Daily Harvest smoothies have been SO helpful because all I have to do is add almond milk to a cup full of healthy, nutrient-dense ingredients and blend. The best news of all is that you can save 50% on your first order at Daily-Harvest.com by using the code “anyaseats” at checkout! Navitas Naturals Chia Rosemary Pumpkin Seeds: Who knew that pumpkin seeds kill parasites? I sure didn’t, but now that I know I’ve been eating them nonstop! Pumpkin seeds can sometimes be a little bland but these Chia Rosemary Pumpkin Seeds are full of flavor and pretty darn addicting. If you want to assist your body in eliminating parasites (because we all have them) without going on any sort of intense cleanse, eating pumpkin seeds is a great place to start! Primal Palate Taste of Asia Spice Pack: Primal Palate Spices NEVER disappoint and their new Taste of Asia Pack is no exception. With Curry Powder, Garam Masala and Chinese Five Spice, this pack is pretty much required for any sort of Asian recipe. As always, these spices are Organic, Non-GMO, Gluten Free and most importantly, Non-Irradiated which means all of the nutrients are still intact. Primal Palate Spices are also now available on Amazon Prime which is pretty amazing! Primal Organics C-Ex: I’ve been eyeing up this product for almost a year. It’s high price tag kept me from purchasing it, but after knowing I would have a good deal of scarring and hyper pigmentation to deal with after this gut protocol-caused breakout (things often get worse before they get better), I finally pulled the trigger. I won’t go into the details about why this product is so amazing or why its worth the price tag, but you can read all about it on the Primal Organics website. Vitamin C is one of the most powerful things you can put on your face when it comes to eliminating discoloration and it’s extremely helpful for skin health in general. Not only that, but for me it actually eliminates the need for moisturizer and that’s coming from someone with dry skin! Amara Organics Dead Sea Mud Mask: During my gut protocol I’ve been taking a lot of Epsom Salt baths to help support my body in detoxing. What I accidentally noticed is that when I put my face into the bath, the inflammation on my face was greatly reduced. Weird, right? Epsom salt is very high in magnesium, so I went on the hunt for a skin product that was also high in magnesium. After a good deal of research I stumbled upon this Mud Mask from Amara Organics. I’ve only used it once, but so far I love it and it absolutely does the same thing the epsom salt baths do – help to soothe inflammation. Wedderspoon Manuka Honey: This honey has always been something I’ve used on my skin, but this month I’ve been using it non-stop. As far as natural anti-bacterials go, honey is always one of my favorites because it’s also extremely soothing and nourishing. A lot of other natural products that contain anti-bacterial properties can be a bit drying (like tea tree oil), but honey is just the opposite. I mix a bit of honey with turmeric and cinnamon and apply it to my face for as long as I want. It’s also great because it’s sticky and prevents me from picking my skin! You can also use honey as face wash to attain similar results. 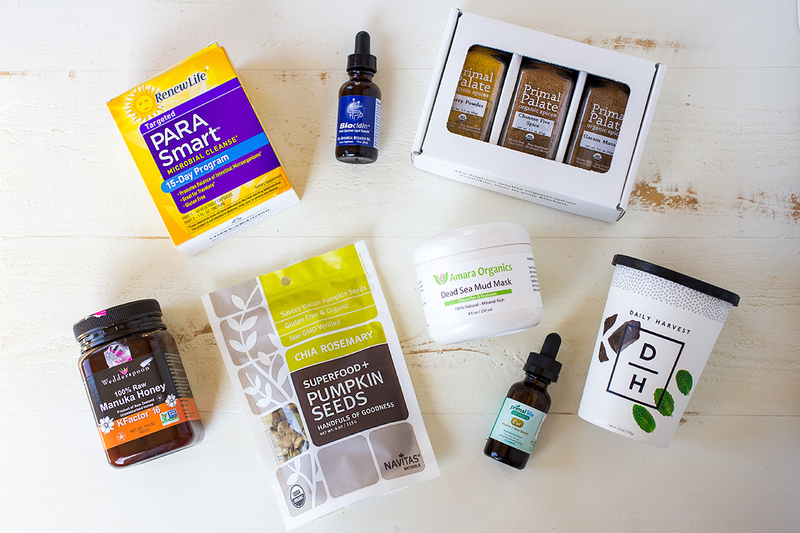 Parasmart: It’s hard to say this is something I “loved” this month because cleansing my body from parasites has hardly made me feel very loving. However, as miserable as the past two weeks has been, there’s no doubt that this product works extremely well. When my results came back from the gut testing I did, they came back negative for parasites. However, because I had excess amounts of harmful bacteria (in the form of ecoli), plus an extremely surpressed immune system in my gut, I was advised that this may mean I could have parasites as well, even though the test came back negative. After two weeks of taking Parasmart, there is no doubt I had parasites. Without getting too deep into the gross details, I eliminated quite a number of the little buggers that were as clear as day in the toilet. Gross, I know, but this is real life people. We ALL have parasites. You don’t have to eat raw fish or travel to a third world country to get them (although this does make you more susceptible), but you can pick them up from unwashed produce, pork (even if its cooked), walking outside barefoot… the list goes on. Although parasites are normal and exist within all of us, it’s only when they start to take over that they cause some pretty severe gut imbalances. The symptoms of a parasitic infection are pretty all-encompassing. From what I’ve read, the extent to which parasite infections go undetected or are misdiagnosed is pretty staggering. For me, aside from relatively mild IBS symptoms, mostly what I’ve struggled with over the past 5-6 years has been acne. Although I always associated acne with some sort of gut imbalance, parasites was never anything I had on my radar. The frustrating part about parasites is that they can be extremely difficult to kill. For that reason it’s advised that you take parasite-killing herbs for a good amount of time to make sure that you kill not only the adults, but the potential parasites that can very soon hatch from eggs that are also stuck in your gut. For that reason, although tomorrow is my last day of my first two-week Parasmart cleanse, I am going to wait about a week and a half and then start the process again for another two weeks to make sure I get them all. Biocidin: This tincture has proven to be extremely effective and powerful. I was prescribed Biocidin to address the harmful bacteria in my gut. Although I am also taking a number of herbal supplements to help kill the bacteria, Biocidin actually helps to breakdown the biofilm in your gut where a lot of this bacteria (and parasites) can live and flourish. I’m not gonna lie, taking this supplement has lead me to feel a bit like I am tearing out my insides, but it’s proving to be extremely effective. I will be taking this for 2 months, but even after two weeks, it’s clear it’s making a huge difference. Just like the parasites, I have actually been able to identify the slimy, unhealthy biofilm that’s been lining my gut for who knows how many years in the toilet. The amount that’s coming out of me has slowly decreased over the past two weeks, so I can only imagine things will start to get easier from here on out. After taking this and some other herbal antibiotics for two months, I will retest after a 30 day period to make sure I’ve not only eliminated the harmful bacteria, but also been successful in creating a new healthy biofilm of beneficial bacteria to support my gut, immune system and overall health.